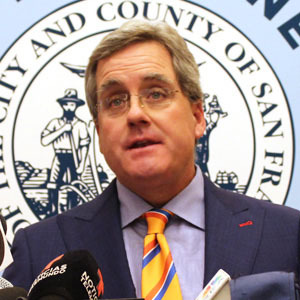 SAN FRANCISCO (April 3, 2018) — City Attorney Dennis Herrera announced today that San Francisco, as part of a coalition of state and local governments, has filed a lawsuit against the Trump administration over its plans to undermine the accuracy of the 2020 U.S. census. The lawsuit, filed today in U.S. District Court for the Southern District of New York, seeks to prevent the Census Bureau, part of the U.S. Department of Commerce, from including an untested question about citizenship status in the 2020 U.S. census. The Census Bureau has previously argued in court that including such a question will “inevitably jeopardize the overall accuracy of the population count” by significantly deterring participation in immigrant communities fearful of how the federal government will use citizenship information. Depressing census participation in cities and states with large immigrant populations directly threatens those locations’ fair representation in Congress and the Electoral College. It also threatens billions of dollars in critical federal funds for education, infrastructure, Medicaid and more. The Constitution requires a national count every 10 years to determine the “whole number of persons” in the United States. “It is one of the most critical constitutional functions our federal government performs,” Congress found in 1997. The census is used to allocate seats in the House of Representatives, determine the number of electors to the Electoral College, draw state and local electoral districts, and distribute hundreds of billions of dollars in federal grant funds to states, local governments and other grantees. Federal researchers found that in fiscal year 2015 more than 130 programs used Census Bureau data to distribute more than $675 billion in funds for things like Medicaid, transportation projects, Temporary Assistance for Needy Families and the National School Lunch Program. The last time a citizenship question appeared on the U.S. census was 1950. Since at least 1980, the Census Bureau, under both Democratic and Republican administrations, has taken the position that inquiries about citizenship on the census would jeopardize the overall accuracy of the population count. Adding a citizenship question to the census will result in an undercount of the population in cities with large immigrant communities, like San Francisco. Immigrants account for 35 percent of San Francisco’s population, as compared to 13 percent of the population nationwide. The lawsuit, led by New York Attorney General Eric Schneiderman, was brought after Secretary of Commerce Wilbur Ross, Jr. transmitted a report to Congress on March 29, 2018, advising Congress of the questions to be included on the 2020 Census. This report includes, for the first time since 1950, an inquiry into the citizenship status of every person in the country. The lawsuit names the U.S. Department of Commerce, Secretary Ross, the Census Bureau, and its acting director, Ron Jarmin. It alleges that adding a citizenship question to the 2020 census violates the constitutional mandate to conduct an “actual enumeration,” or count, of the population and violates the Administrative Procedure Act; and is arbitrary, capricious and an abuse of discretion under that act. The lawsuit seeks a court order preventing the citizenship question from being added to the 2020 census. The lawsuit was brought by the cities of San Francisco, New York, Chicago, Providence, Philadelphia and Seattle; the states of New York, Connecticut, Delaware, Illinois, Iowa, Maryland, Massachusetts, Minnesota, New Jersey, New Mexico, North Carolina, Oregon, Pennsylvania, Rhode Island, Vermont, Virginia and Washington; the District of Columbia; and the bipartisan U.S. Conference of Mayors. 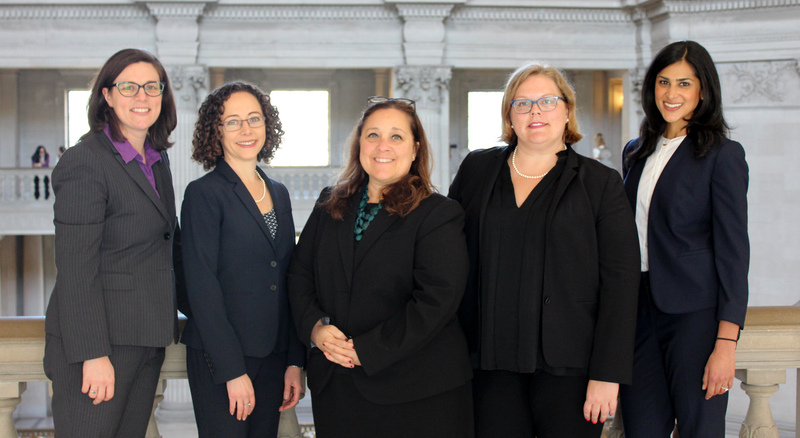 From left: Colleen Dietterle, Mollie Lee, Yvonne Meré, Erin Kuka and Neha Gupta are part of the team working on the case.